In a few months, Maëlle Ricker will compete in her fourth Olympic Games at Sochi as the defending champ, Women’s Snowboard-cross. At the Vancouver 2010 Games, she triumphed as the first Canadian woman to win Olympic gold at home. The scrappy, almost gladiatorial sport of snowboard-cross – frequently cited as one of the roughest in the Winter Games – has not been easy on Ricker. 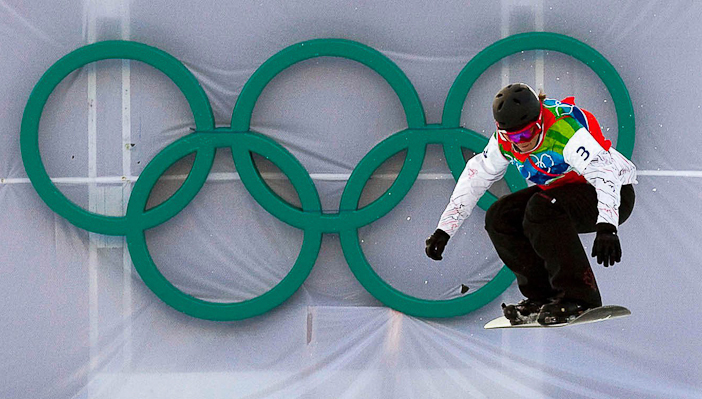 In 2006 when snowboard-cross debuted at the Turin Olympics, Ricker advanced to the final but suffered a shocking crash which left her with torn muscles and a serious concussion. Another injury four years earlier had kept her out of the Salt Lake City Olympics in 2002 – and over the course of her career she’s had a total of eight surgeries on her knees – so Ricker’s victory in Whistler and her continuing competitiveness in a cutthroat field is an even more striking success. Ricker clears a jump on her way to gold in West Vancouver on February 16, 2010. Snowboard-cross was the most hazardous sport at the Winter Olympics in Vancouver, with nearly 75 per cent of female athletes sustaining injuries during the rough-and-tumble races, according to a medical study. THE CANADIAN PRESS/Sean Kilpatrick. Ricker is a Whistler Blackcomb athlete. For more on WB’s athletes, click here.